From a friend's porch in Larapinta, a suburban pocket west of Alice, we witnessed a domestic dispute break out among the family next door. At first it was a bit of shouting and shoving. When one man appeared on the scene wielding a golf club in one hand and an axe in the other, we called the cops. More than 20 minutes elapsed before they arrived, by which time the dispute had subsided. We were perturbed. It could be the police were busy attending another call-out. But their laconic attitude gave the distinct impression they weren't all that concerned. We couldn't help but wonder if the response would have been different had it been a white family. Thornton's debut feature Samson and Delilah is an ode to his town and its extremes. It's an ethereal love story between Aboriginal adolescents, that takes place against a backdrop of addiction, violence and displacement. Racism is not an explicit presence in the characters' lives, but it is there, like a foul breath that muggies the air around them. 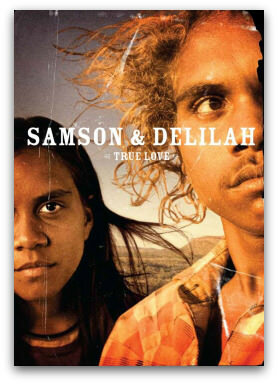 Samson and Delilah are young teenagers from a remote community. Samson sedates the grinding tedium of his life by sniffing petrol. Delilah lives a somewhat more comfortable existence — her artist grandmother makes a reasonable living off her painting sales. Soon Samson's cumulative boredom and frustration leads to a violent altercation with his older brother, while Delilah incurs blame and a beating from the local women when Nanna dies in her sleep. The two are outcasts, and they embark on a pilgrimage to the town, where they take up residence beneath a bridge on the dry bed of the Todd River. Samson and Delilah barely speak to each other, except with gestures and body language. But a bond formed out of necessity grows into a love borne from the fight for survival. And just as their love remains largely unspoken, so do many of the film's salient themes. The exploitation of Indigenous artists; the largely ineffectual but pervasive presence of Christianity, residual of the region's missionary history; the disinterest of white tourists, for whom the homeless teens are a nuisance or barely glimpsed spectres; all are referenced briefly but matter-of-factly in the film. Thornton reserves judgement and lets the audience decide how to respond. Other elements of Territorial life are conspicuously silent. The absence of Government foot-soldiers highlights how little the Intervention has benefited those it purports to help. The exclusion is intentional: Thornton told The Big Issue recently that the Intervention 'will come and go, and Aboriginal communities will be the same'. And despite the role of addiction in the story — which proves to be both relentless and contagious, as Delilah, battered by the hardship of life on the streets, begins to share Samson's self-medicating — there's no mention of the low-aromatic Opal fuel, the introduction of which is, to date, the most radical attempt to combat petrol-sniffing in the Territory. On this, Thornton and the experts are of a voice. Chris Warren, who works in substance abuse prevention with an Alice Springs based council (who were, incidentally, part of an alliance that lobbied to bring Opal to the Territory), says a recent senate report on Opal 'strongly supports our campaigns to capitalise on the opportunity of Opal'. Samson and Delilah's strength is its stark realism, balanced with an emotionally engaging story. Thornton's choice of non-professional actors Rowan McNamara and Marissa Gibson as the title characters underscores both. Aspects of their world are reflected in their characters', and they bring authenticity and youthful cheek to their roles. If empathy and understanding were Thornton's goals, his actors and story are up to the task. Post script: Of course, Alice doesn't have the monopoly on racism. 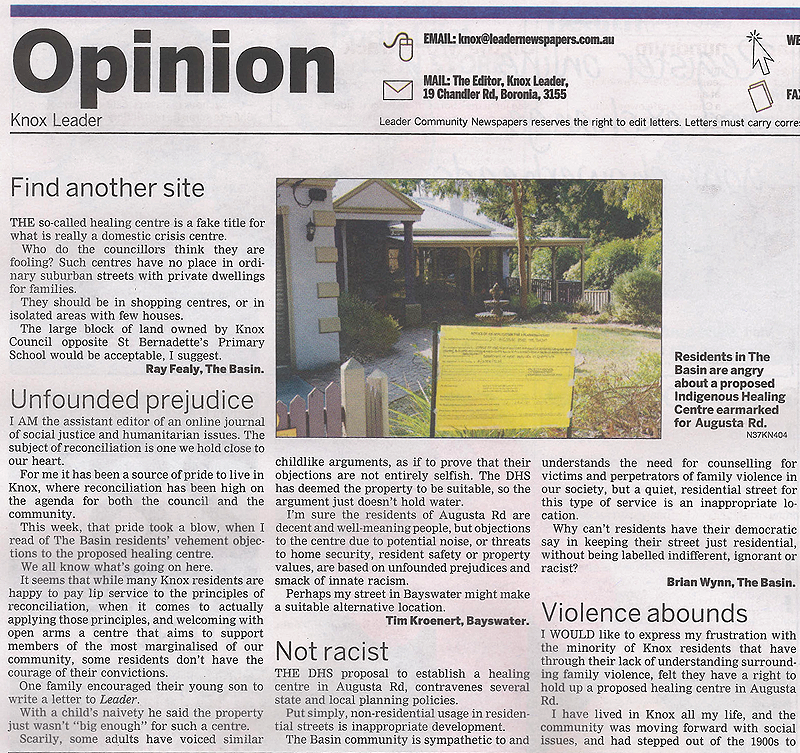 I recently wrote a letter to my local paper, to voice my concern that residents of a local suburb were protesting the construction of a healing centre for Indigenous people impacted by family violence. It seemed to me that their objections, based largely on fear of an increase of violence and crime in the area, reflected inherent prejudice, even ignorance. If racism is a rash on the skin of society, both in Alice and to varying degrees across Australia, then empathy and understanding are the best salve going. And every Australian would do well to see Sampson and Delilah. Tim Kroenert is Assistant Editor of Eureka Street. His articles and reviews have been published by The Age, Inside Film, the Brisbane Courier Mail and The Big Issue. A fine piece Tim. Thank you. Regarding the healing centre mentioned in my second to last paragraph, I should add that, to their great credit, the local Councilors heard and rejected the residents' objections, and have given the centre the go-ahead. The residents group is now taking the claim to the Victorian Civil and Administrative Tribunal. Tim, keep writing these pieces. We who have little opportunity to see and feel the anguish of people caught up in this issue, appreciate the perspective that you are able to share with us, and thus, we are able to filter through the newspaper/TV articles (designed to SELL papers & TV advertising time!) and gain a sense of empathy with those who are "our neighbours", those who suffer. We may not be able to do more than to try to raise awareness, but, armed with the material that you have shared, we may try!! With reference to the anecdote at the start of the article. If it had been a white woman getting bashed would the commentator have sat idly by or would he/they have plunged into the defense of the woman. Evidently these people sitting on their veranda have not attempted to intervene when an Aboriginal woman is getting bashed, nor do they intend to. If they had attempted to intervene they would would have more than likely been attacked by both or all parties there. Knowing this they just sat back and purposefully watched another person get bashed - then blame someone else. Hi Kim ... I've spared the details, but I can assure you that the 'domestic dispute' I refer to can not be accurately described as 'a woman getting bashed' or even 'a person getting bashed'. I do take your point about non-intervention. But under the specific circumstances we judged the best course of action was to call the police. Race was not a contributing factor to this decision. Thank you, Tim, for an excellent review. Inspired by it, I saw the film two days ago and was saddened and moved but also left with a sense of hope. The theatre was packed and the audience was unusually attentive and silent, during and after the film. In reference to the comments made by Kim to the anecdote at the start of the article ... i am the owner of the verandah in question, and let me assure you that we never "sit idly by while people get bashed". These disputes are unfortunately a daily occurence in Alice Springs and if we called the police for every raised voice we would be putting undue pressure on an already undermanned police force. I believe this anecdote was used to give people a snapshot of what life can be like in these areas and unless someone has experienced a situation like this it is very hard to comprehend. Domestic disputes are a lot more out in the open in Alice Springs because unfortunately a lot of people visiting in town do not have any suitable accomodation so rather than have their arguments behind closed doors it is very public. I can assure you that we do call the police when nessecary and my response to 'domestic disputes' does not have anything to do with the color of a persons skin but rather the gravity of the situation. Hey Tim, Thornton and you both know some truths about Alice Springs: get Aboriginal people taking responsibility for their livelihoods rather than begging for a living. The variety of Quaker service in Aboriginal communities and around the world is extraordinary. In light of the GFC and climate change, the Quakers' emphasis on small-scale food and water security projects will prove prescient.